Summary: In 1925, Englishwoman Gwendolyn Hooper has just married a young widower and tea plantation owner, Laurence Hooper, and she travels to her new home in Ceylon, where she quickly learns that perhaps she doesn't know her new husband as well as she thought she did. The judgment: This is one of those books that really moved in with me, and I found myself tearing up at the end, especially when I saw some unexpected emotion from a particularly hard-hearted character in his great moment of redemption. This would make a terrific epic film if Hollywood could manage not to bungle it up! 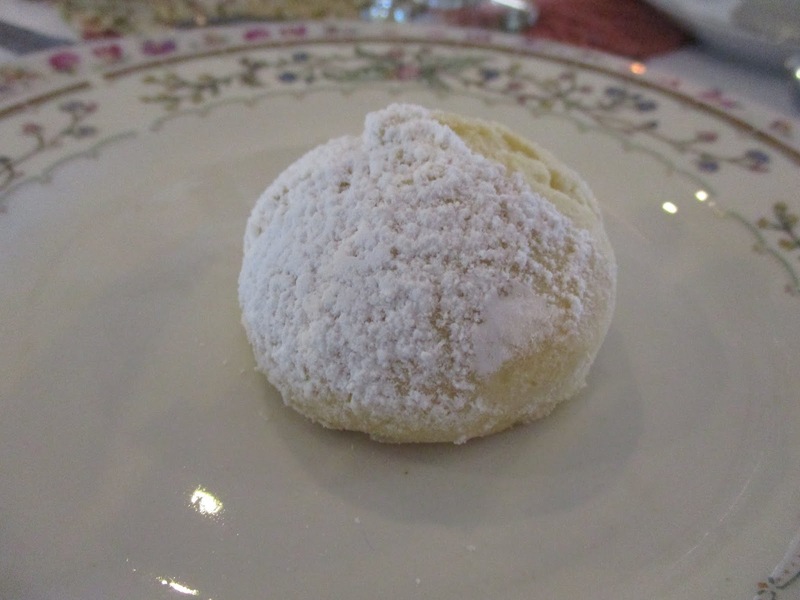 • When I read about the processing machinery at the tea plantation, I couldn't help recalling my tour of the Charleston Tea Plantation in South Carolina and the machinery there. Did anybody else have that reaction? 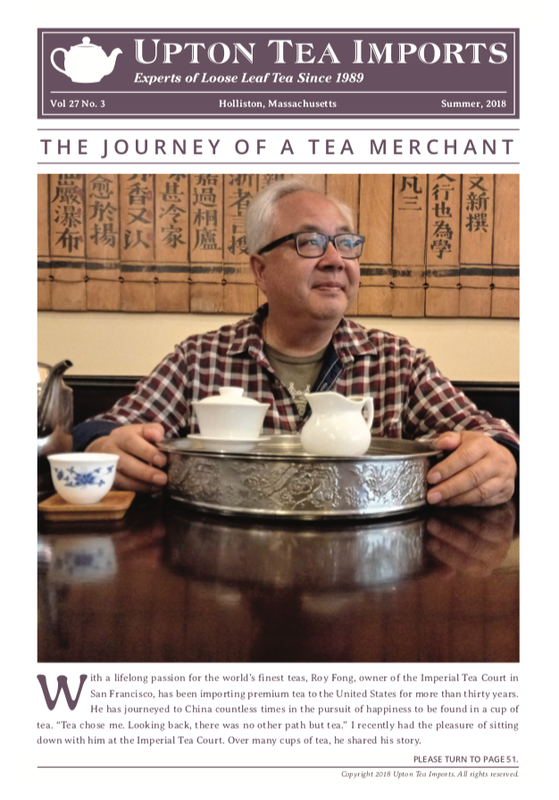 • Laurence Hooper seemed to have a detached approach to the workers on his tea plantation and lets Nick McGregor manage them. Did Laurence turn a blind eye to too many things? • And the most interesting question of all: Was Gwen a good mother? 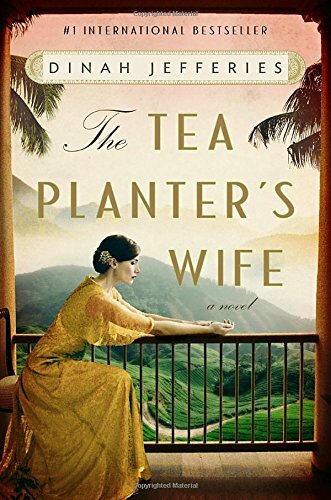 If you're in a (non-virtual) book club and haven't read this book yet, I think The Tea Planter's Wife would make a wonderful selection! 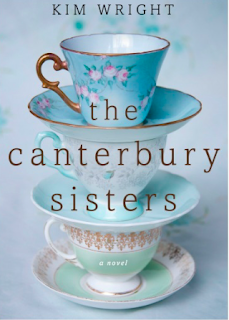 Next Month's Book: I'm taking a chance here and choosing a book based only on its cover, The Canterbury Sisters by Kim Wright! 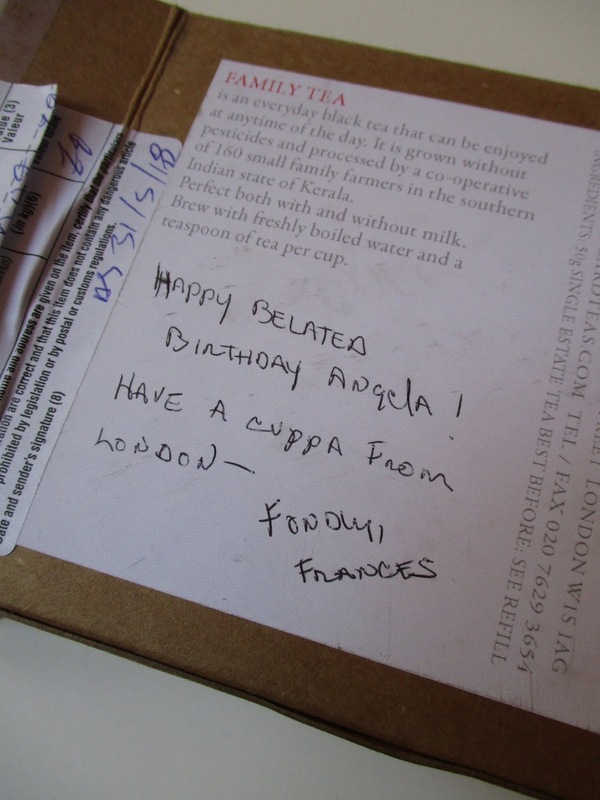 A gift of Postcard Tea! You know how friends go abroad and send you a postcard? Well, this time, tea friend Frances L. from California traveled to England and thoughtfully sent me not a postcard but rather some Postcard Tea! 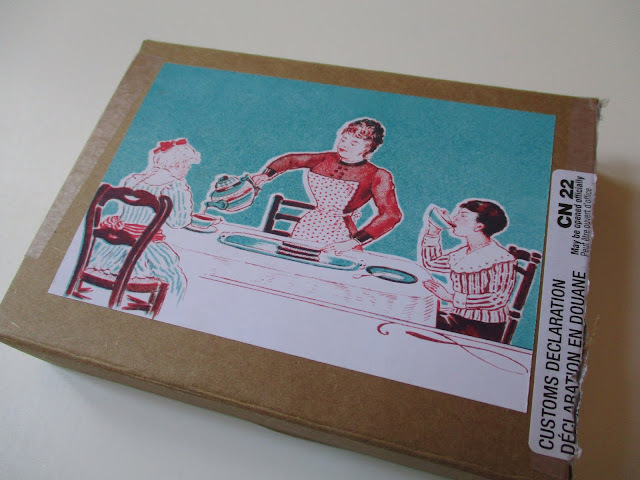 There's even space right on the box for you to include a note to the recipient! And I just love the graphic on the back, especially the pretty red and turquoise coloring! 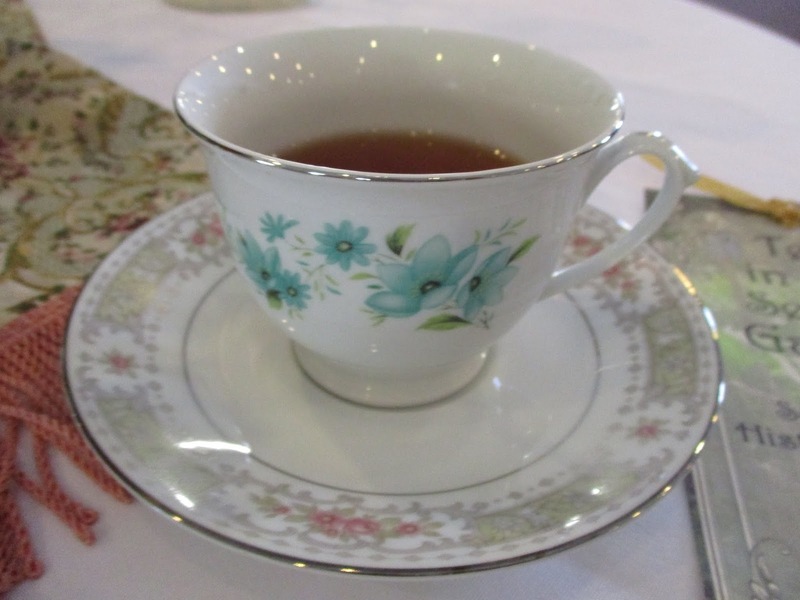 The tea itself was quite scrumptious! I opened the packet and inhaled that scent so reminiscent of fresh wood shavings, and this black tea was quite refreshing and, despite the pretty copper color in my teacup, had not a hint of astringency! 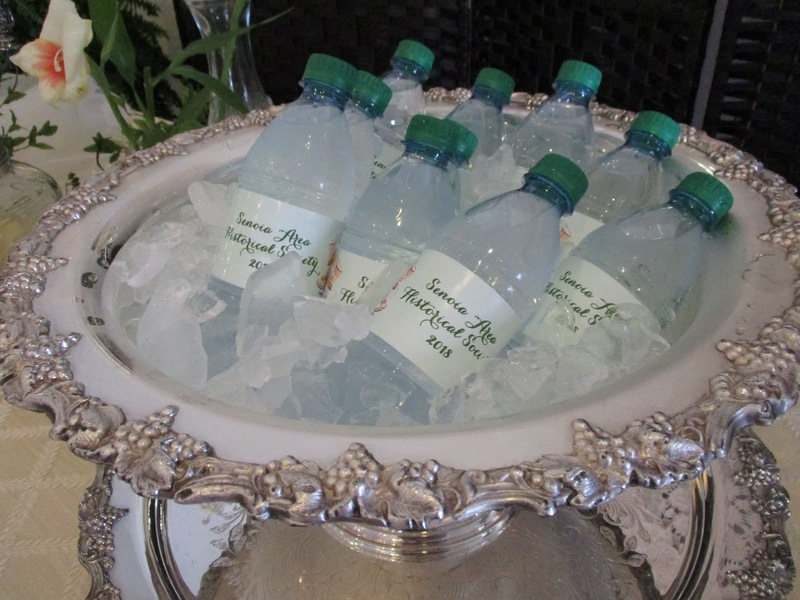 I was hooked from the first sip and am so delighted Frances thought of me while on her trip. If you'd like to check out Postcard Teas for yourself, click here to learn more and see a photo of their charming shop! So this year's "Tea in the Garden" of the Senoia Area Historical Society got moved because of the storms that blew into town over the weekend, but those busy bees at the historical society had quickly transformed the local senior center into a tearoom, and it was so lovely! Right away, I ran into some old colleagues and took their photos in their hats. Aren't they cute? 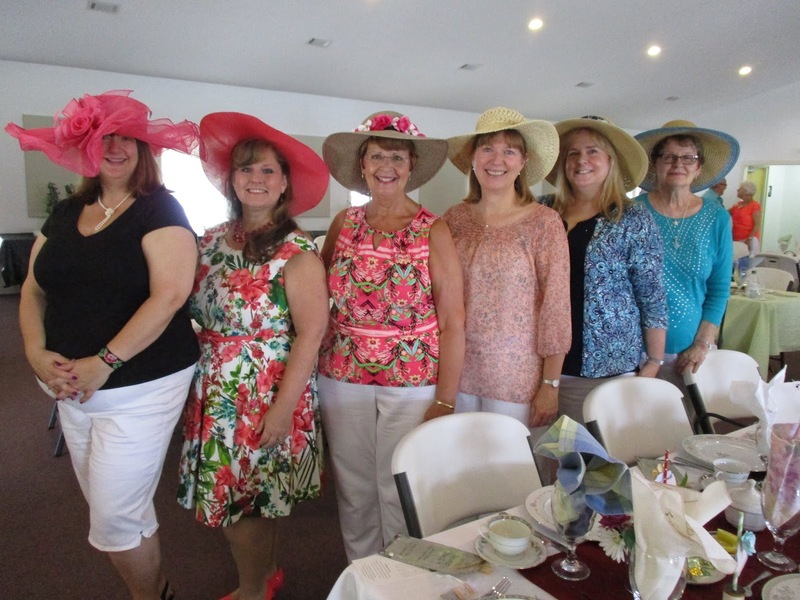 I was there to enjoy the tea and serve as a judge for the annual hat contest. 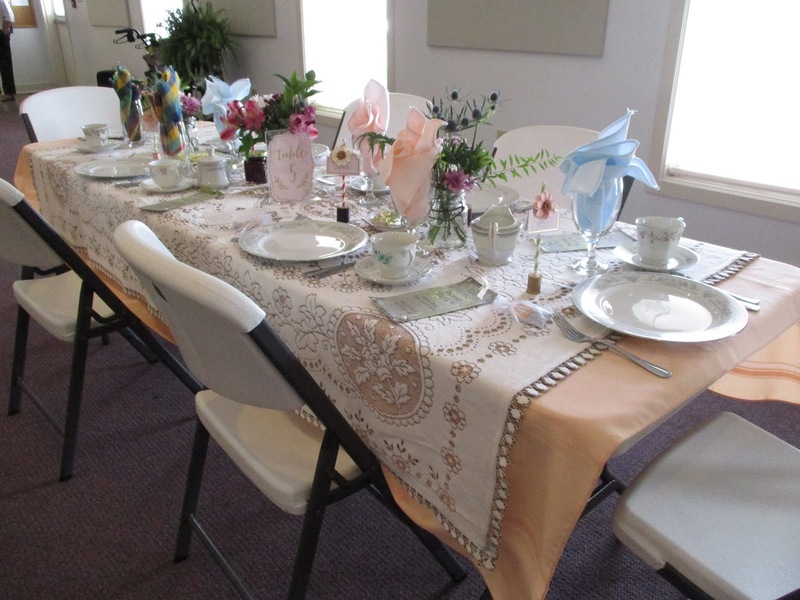 Each table was dressed to the nines, and formal china was used at every seat. 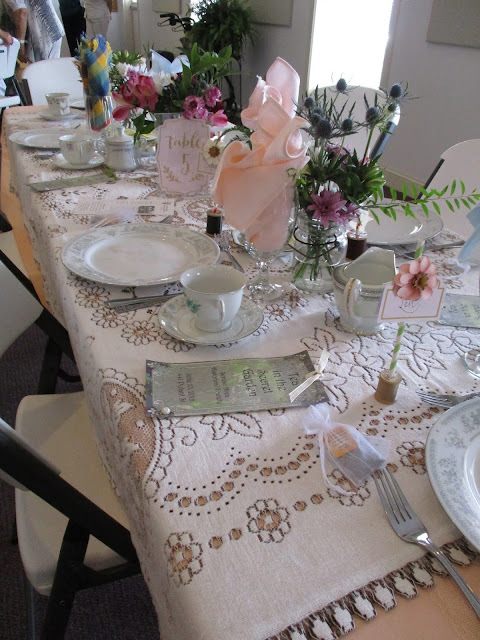 I love seeing lace tablecloths that are actually being used instead of folded away in a linen closet! 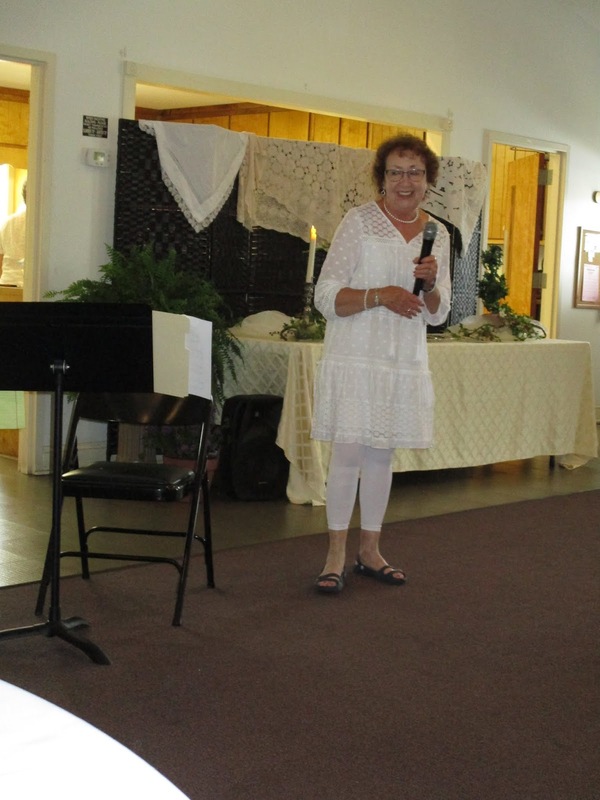 Another thoughtful touch was that the historical society paid tribute to the late Totsie McKnight, a beloved local lady whose memory still looms large. I had the pleasure of knowing Totsie and miss her still, so I smiled when I saw this display—and her recipe! Now here's an idea I am going to use myself. They had bottled water in a silver punch bowl, and the labels had teacups on them! Aren't these great? 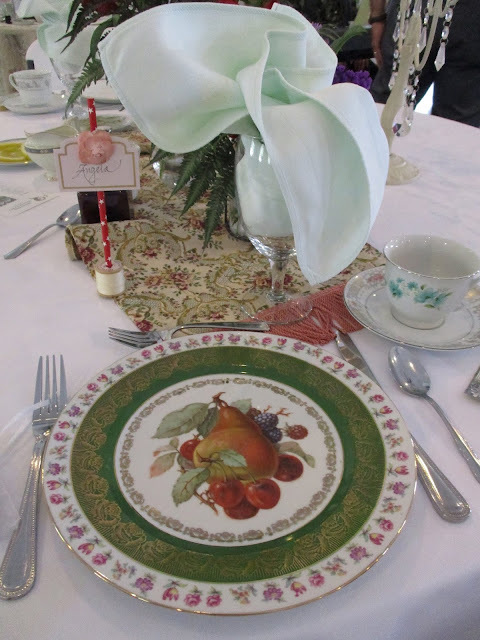 This was my place setting, and I had to ooh and aah over everything before I partook! 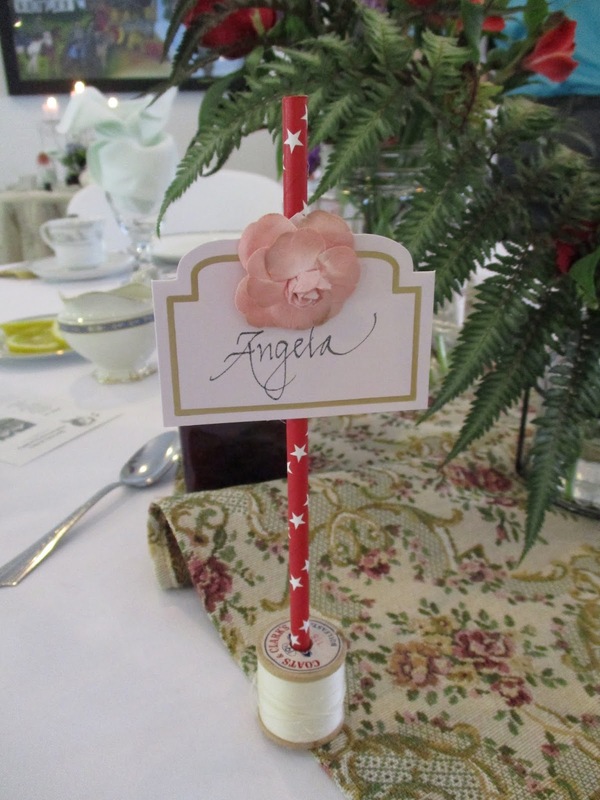 Another clever touch was the place cards in vintage spools of thread! 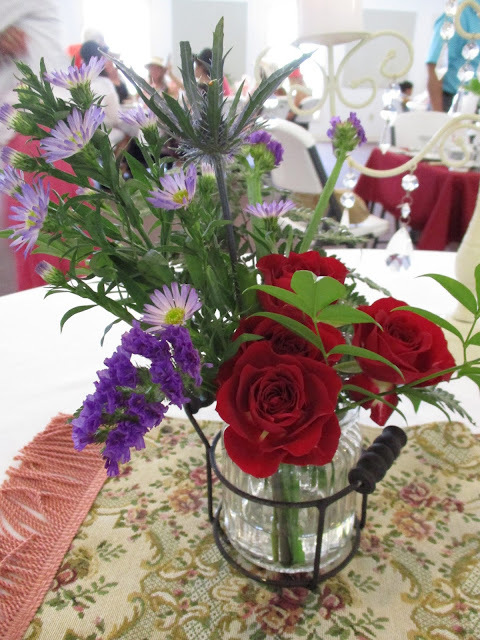 And while we didn't make it to the garden because of the rain, the garden made its way to us in the form of beautiful fresh flower displays on all the tables. 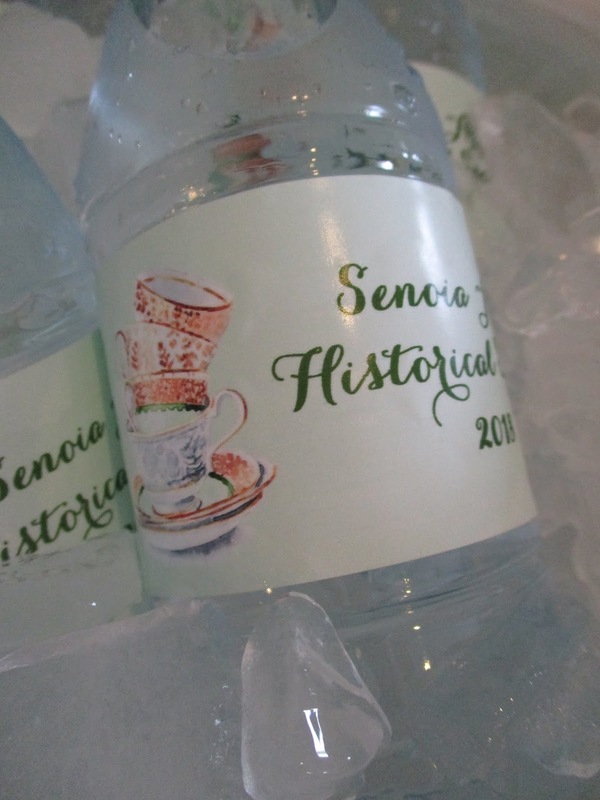 I am always amazed at how much detail the Senoia volunteers put into their tea! We had hot Vanilla Caramel Tea as well as a delicious iced Raspberry Tea. And scones were served with Raspberry Pecan Amaretto Preserves, which were so tasty! My friend Nancy Roy coordinates the tea and has been active in Senoia's historical society for the 20-plus years I've had the pleasure of knowing her! 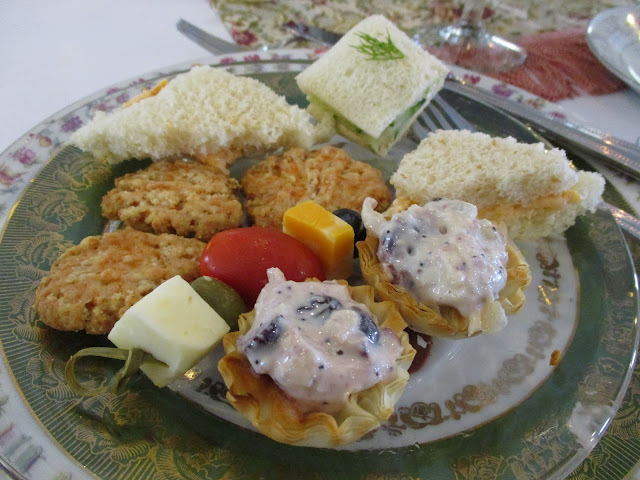 The menu this year included Cheese Buttons, Cucumber Sandwiches, Pimiento Cheese Sandwiches, Chicken Salad in Phyllo Cups, and a Fruit and Cheese Skewer. And dessert was Totsie's Tea Cakes and Rich's Frozen Fruit Salad (for those of you who have my department store tearoom book, this is the fruit salad in that book, and I loved their pretty presentation). 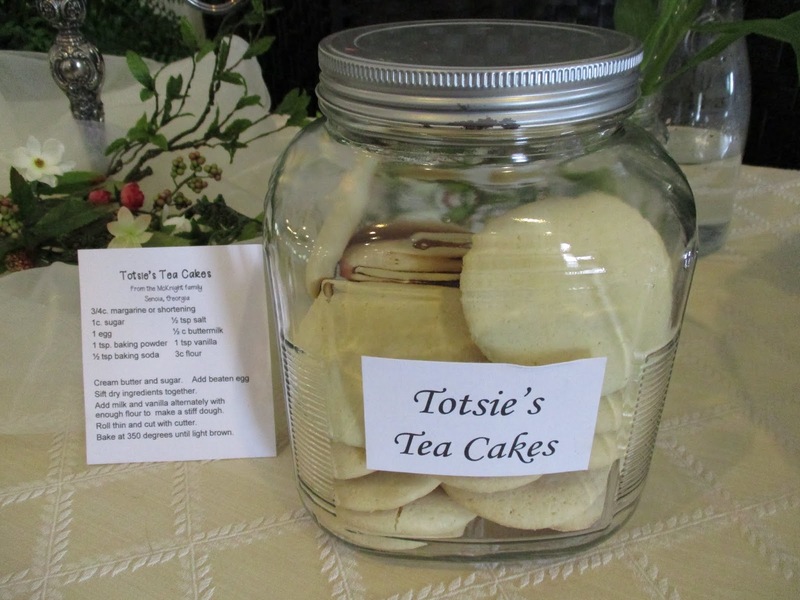 Totsie's Tea Cakes, by the way, were soft and delicious, as were all the foods at this lovely, lovely tea! And I was talking too much and didn't think to get a photo of the hat contest winner, but I can assure you that you all would have approved. She was a lovely lady wearing a vintage white hat with her lacy ensemble, and the other two judges and I all spotted her immediately, which made our job extra easy this year! 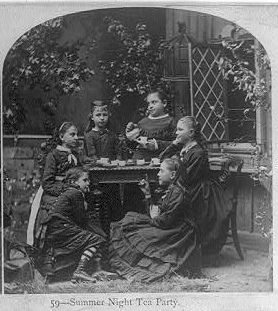 My latest tea find on the Library of Congress website is this photo, and the description reads: "At Farley tea. 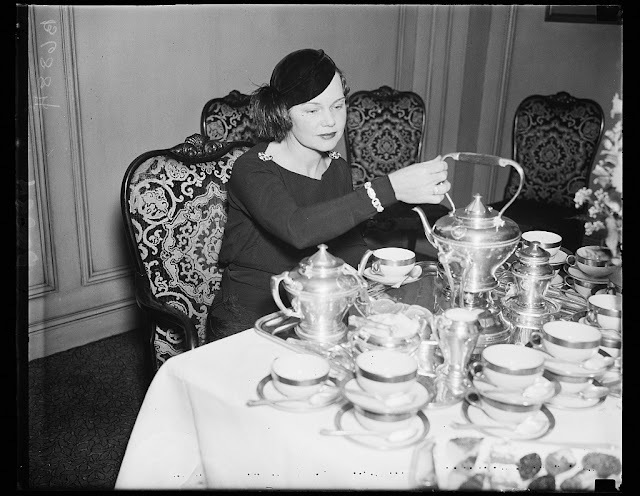 Mrs. Daniel Skilling of New York City, a guest at the tea given by Mrs. James A. Farley, wife of the Postmaster General, on the afternoon of cabinet wives at home. 1/16/35"
This photo makes me wish *I* had been invited to the Farley tea! 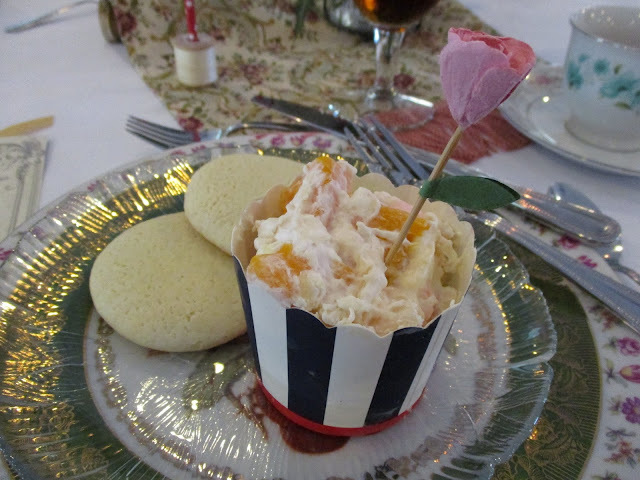 But Lord willing, I will be at tea in Senoia on Saturday, where I'll once again be a judge for their hat contest. Photos to come! Warmer temperatures mean I'm drinking more iced tea these days, so for fun, I picked up a couple of new-to-me varieties at Ingle's the other day. 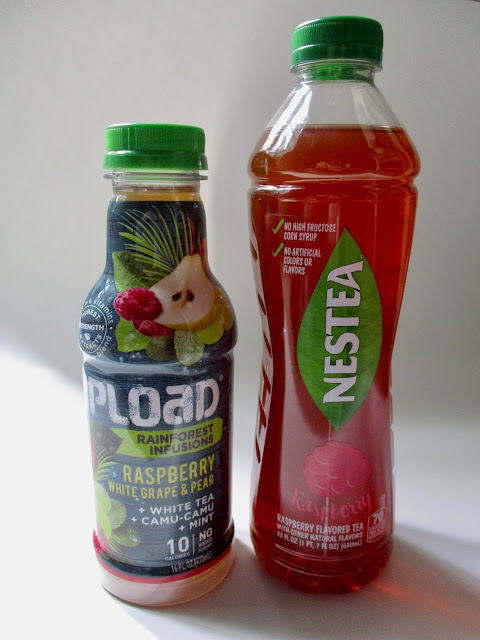 I actually got the Nestea tea in both peach and raspberry flavors, but I drank the peach flavor on the way home. Or perhaps I should say that I *tried* to drink the peach tea on the way home. There's no nice way to say this, but their peach tea has to be one of the worst bottled teas I've ever tried, and I've sipped some stinkers. I found myself wondering, "Have the testers ever had tea before? Did they try this out on any actual humans?" I don't like to be negative, but this chemical-tasting murky liquid just seemed to bear no resemblance to actual tea. I was so shocked by how bad it was that I took one more equally dreadful sip just to be sure, and the rest of it went in the trash. 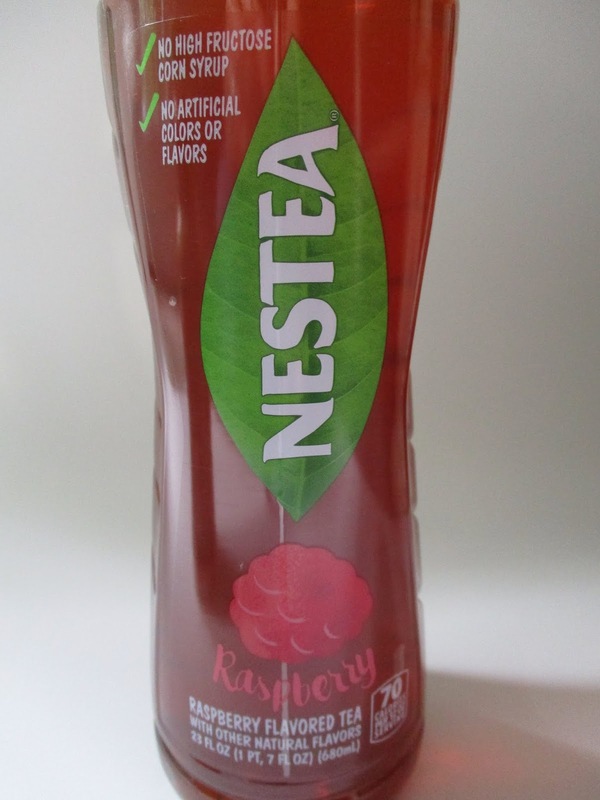 I was (and remain) puzzled by how a company could make such an awful-tasting tea. I bravely (or foolishly?) 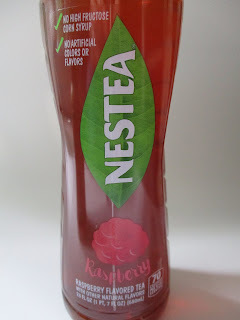 tried the raspberry tea the next day, and it was flat tasting but tolerable, nowhere near as bad as the peach flavor. Lesson learned. No more Nestea for me! 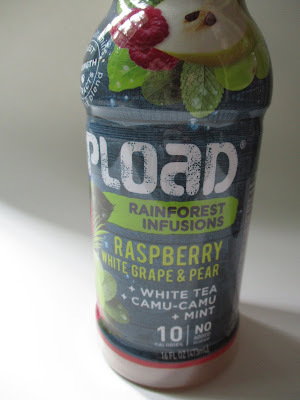 Next I tried the Upload Rainforest Infusions Raspberry, White Grape & Pear White Tea, which was immensely drinkable, although to be fair, it takes like grape juice. Which is good if you like grape juice. In which case, why not just buy grape juice, right? Now that that little exercise in tea-tasting is over, I'm sipping a nice black tea I steeped along with fresh mint leaves and then cooled in a pitcher in the fridge before serving over ice. It's so good, I wish somebody would make this tea and bottle it! I was in a new antique store in Dallas over the weekend, the Dali and Davinci Marketplace, when I spotted a new teacup for my growing collection of blue models. This one was the prettiest soft shade of a blue that had a touch of periwinkle in it, and the scalloped edges, rosy interior, and $6.95 price tag (and to my surprise, 20 percent off that) made this one a winner. But you know what another of my favorite features is on this teacup? The backstamp! I'd heard of Steubenville but not Monticello made by Steubenville. 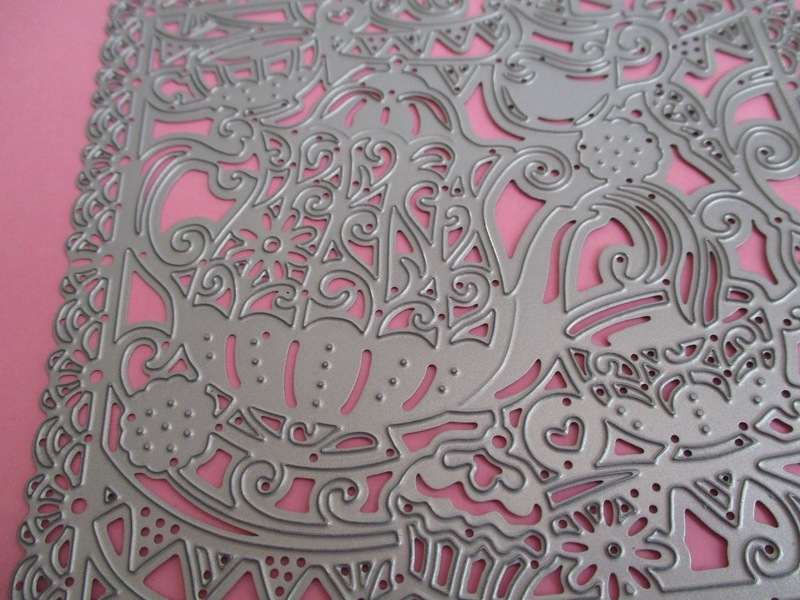 That's got to be one of the most detailed backstamps I've ever seen, and I decided I had to do a little research. 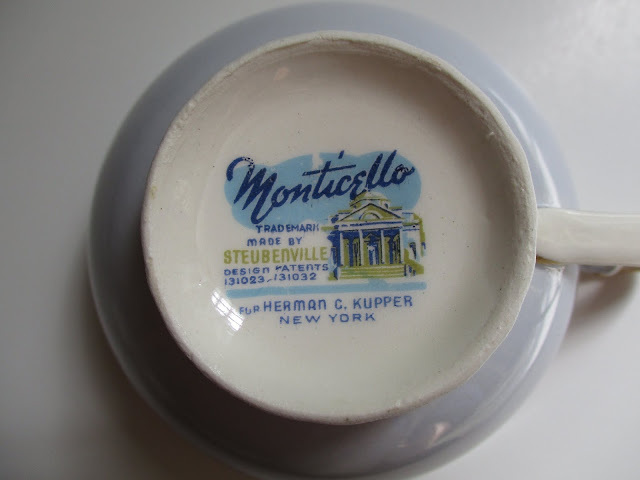 Steubenville Pottery Co. of Steubenville, Ohio, was in business from 1879-1959. The Monticello pattern was produced in the late forties and early fifties, and pieces were marked with a special backstamp listing the distributor, Herman C. Kupper of New York. 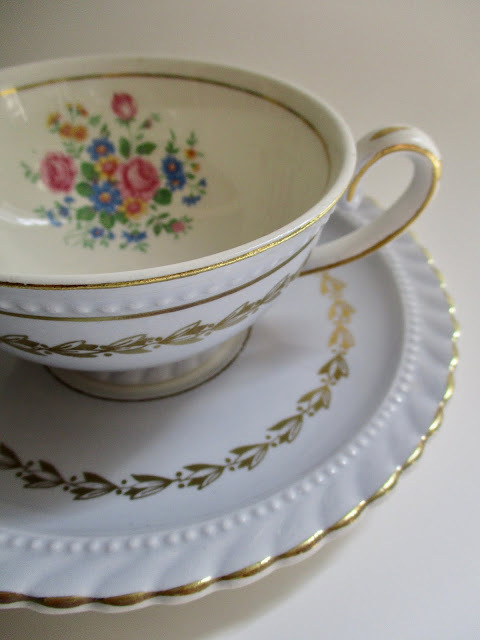 I found an old ad for Monticello pieces, and it called these wares "Monticello—America's distinguished dinnerware" and said it was available at "better stores everywhere." I suppose so-called snob appeal has always been a selling tactic, yet how ironic that years later, I would purchase my Monticello secondhand. But then again, if they'd just said "American's pretty dinnerware," that wouldn't have been much of a slogan, would it? Holloway! And I've sent you an email so that I can get your mailing address. Congrats on winning! 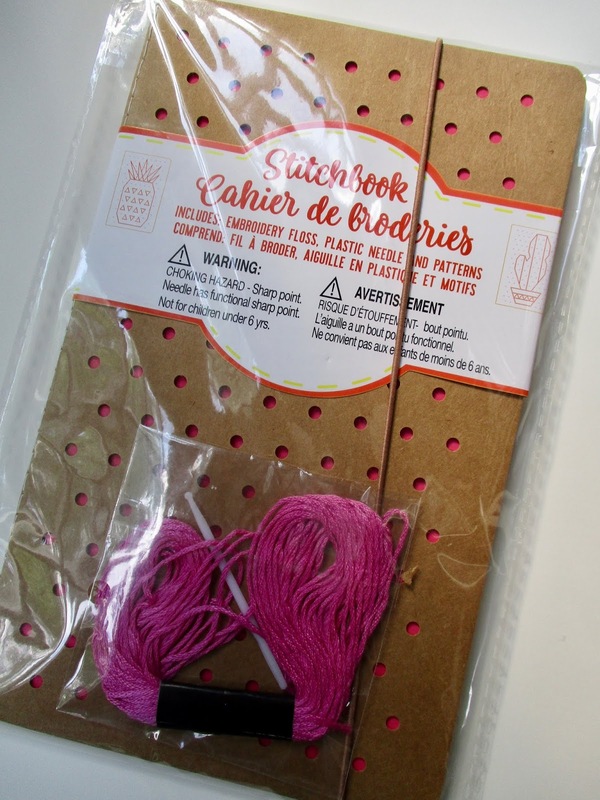 The $1 "cahiers de broderies"
I found these "cahiers de broderies" at Dollar Tree over the weekend and immediately knew I had to get a couple. 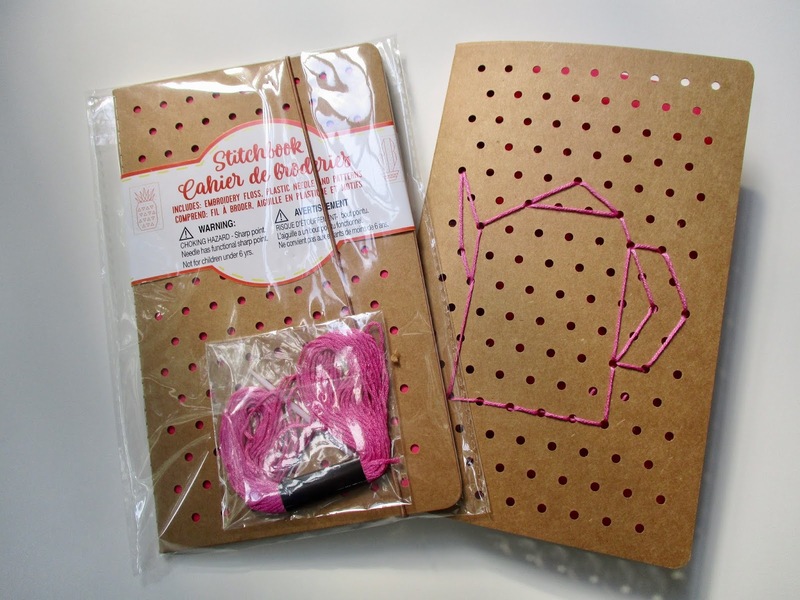 The notebook comes with needle, embroidery thread, and an insert containing patterns for a few designs such as a cactus and a popsicle, but I opted to try something else and created my own design. But surely one of you can improve upon that, eh? 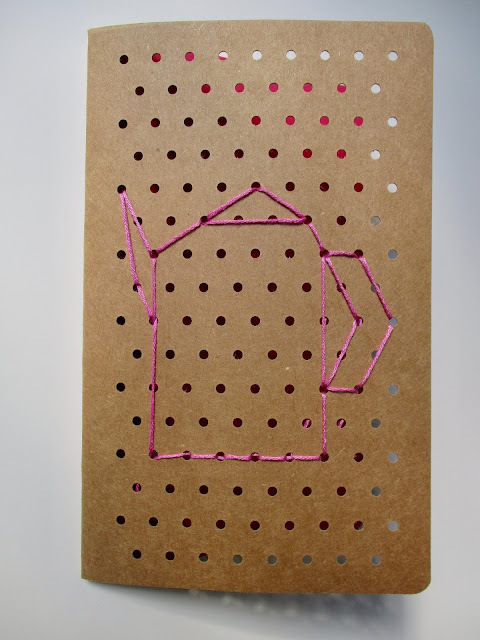 Just in case, I've got one more notebook set on standby, so I can always try a new and improved teapot design if I come across one. Suggestions welcome! 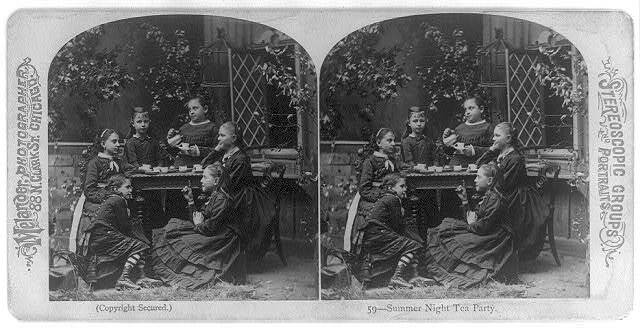 Now this is really random, but I found this photograph on the Library of Congress website and like it just because it's titled "Summer Night Tea Party." This is a detail of a shot from one of those old stereoscopic cards. 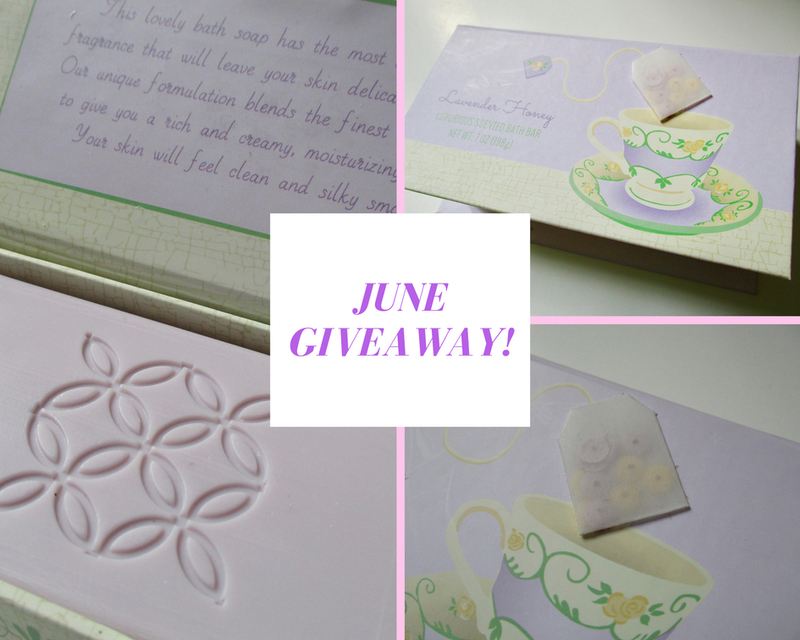 I found the cutest, most yummy-scented soap over the weekend and decided it would be great for the June giveaway! 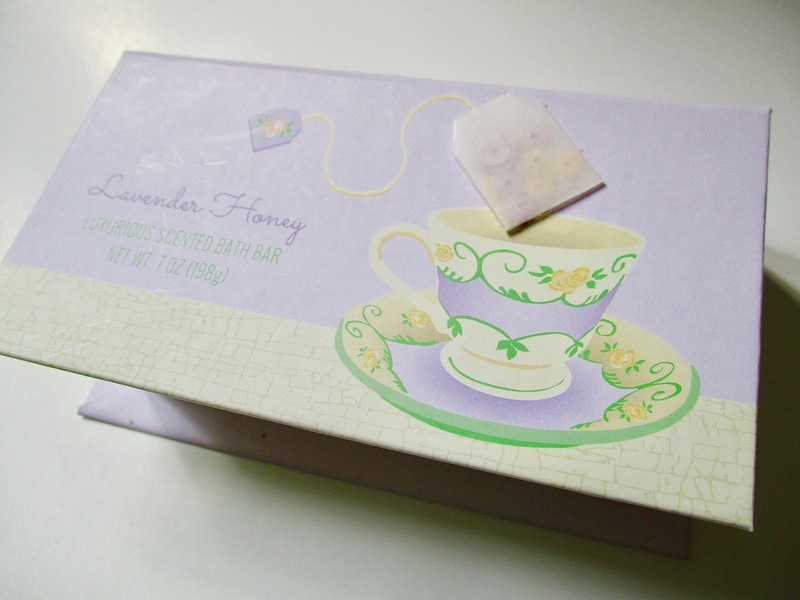 The Lavender & Honey soap itself has a delightful floral scent, but the packaging is what really caught my eye, something that surely any tea lover would enjoy! So if you'd like to win it, just leave an "Enter me" to this post between now and 7 a.m. EST on Friday, June 15, making sure to include an email address so I can contact you if you're the winner, and you'll be entered to win. US only, please. Good luck! 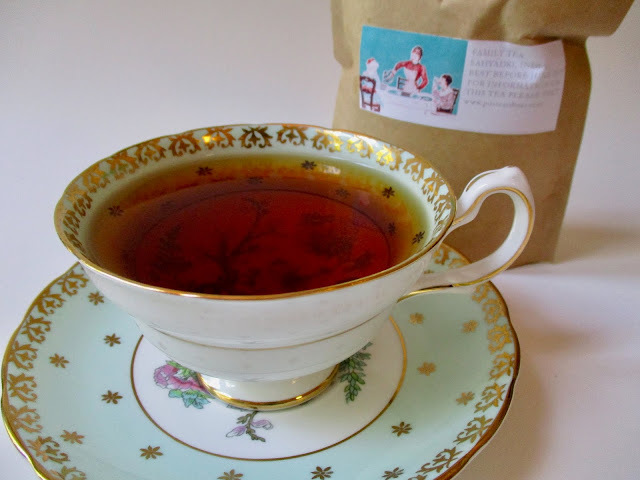 A tea I can *guarantee* you've not tried! Well, this is new! My friend Kathy, who is a huge dog lover, recently shared a video promoting a new tea that I've certainly never had on my tea shelf, Barking Mad Creations Herbal Tea for Dogs! 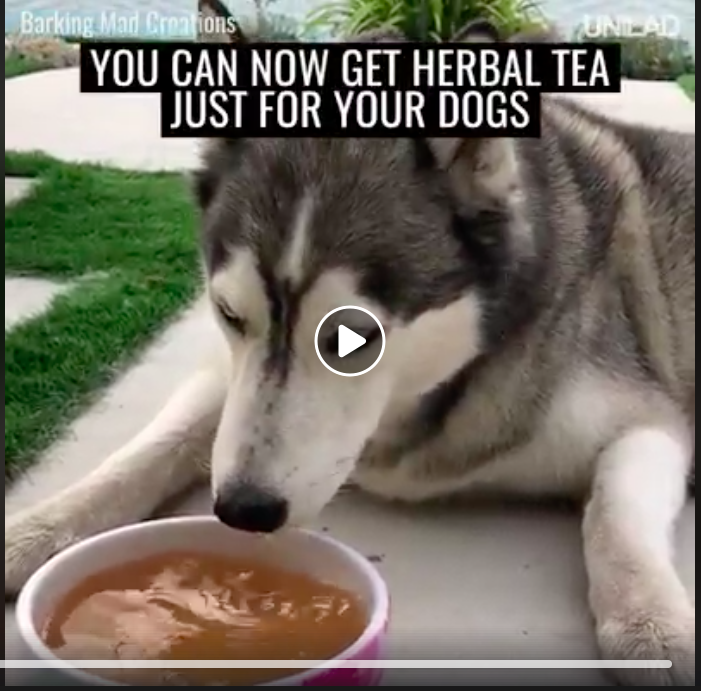 Now I haven't tried this tea, for obvious reasons, and I don't have a dog, but I have a feeling this quirky video would be of interest to many of you, and the product itself might be appealing to the tea lovers who are also dog lovers. I only ask that you not serve me tea out of the same teacup your dog uses! 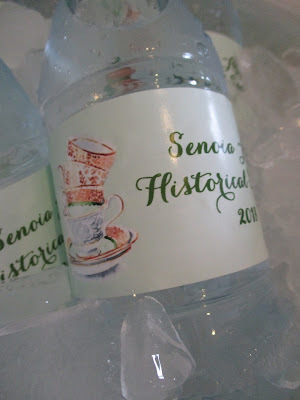 It was interesting to read about how the tea is prepared for the dogs, though (never hot!). Do you suppose dogs like tea as much as we do? I mean, why not! So what do you think about tea for dogs? Yes or no? 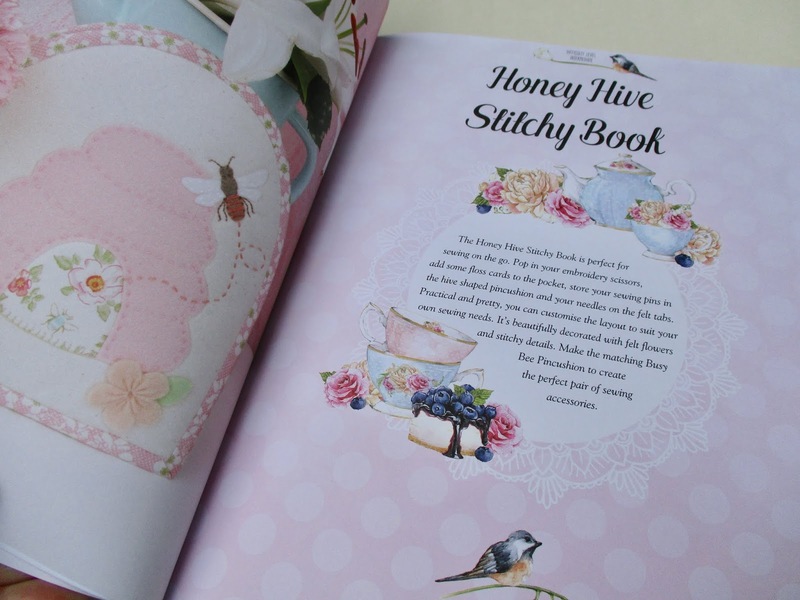 So a woman in Australia writes a craft book that is printed in Turkey and bought by a woman in Newnan, Georgia. If that's not the global economy at work, I don't know what is! I was at my local Joann store the other day looking not necessarily for any particular craft book but just for something pretty. The day was gray and rainy, and I wanted something that "spoke" to me. Do you ever have a day like that? 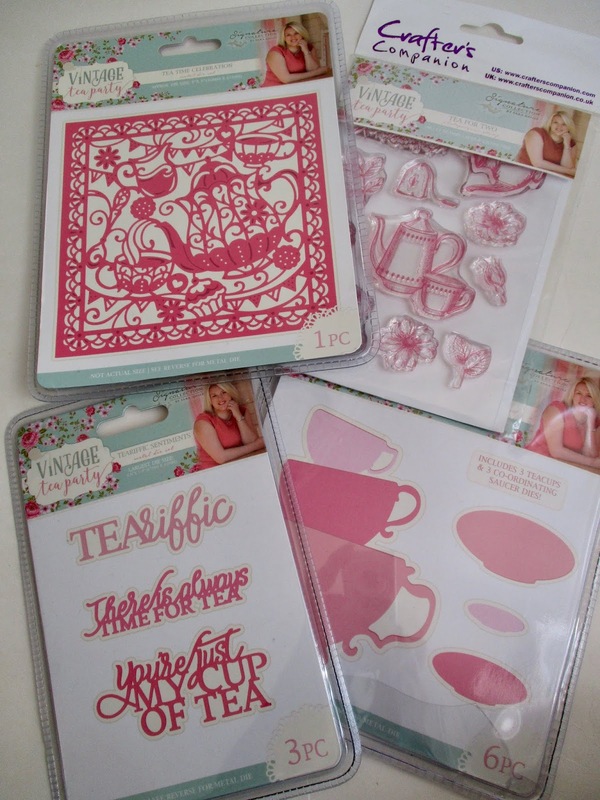 Well, this is what I came across, and I spotted the teapot and teacup graphics immediately! Even a tea bag! When's the last time you saw artwork of a tea bag? I wasn't at all surprised to find a pattern for a "Tea Party Tea Towel" inside. 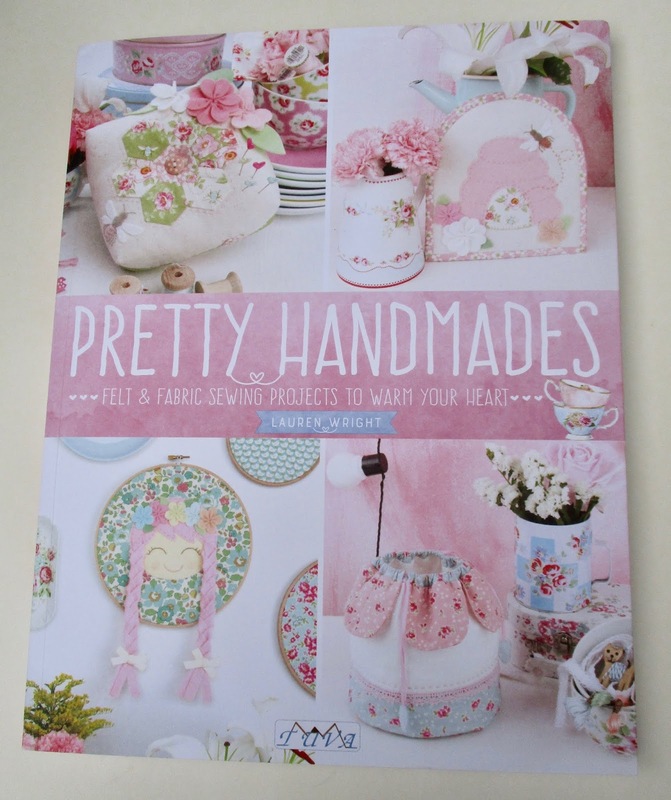 I don't care if I ever make it or not, I've just gotten so much pleasure from studying the pages of this lovely book! 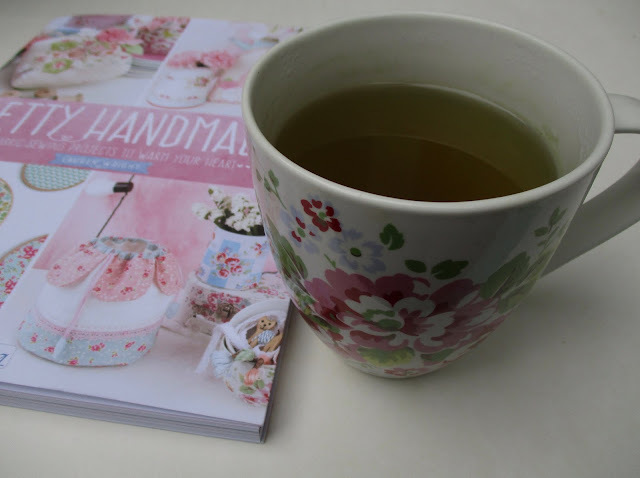 Best enjoyed with a cup of yummy green tea, of course! I got my copy for 60 percent off thanks to a well-timed Joann coupon. That made this book's price about $8 and some change, less than the cost of many magazines, I note, but it's also available on Amazon if you don't have a Joann coupon handy. So here's what I made this weekend! 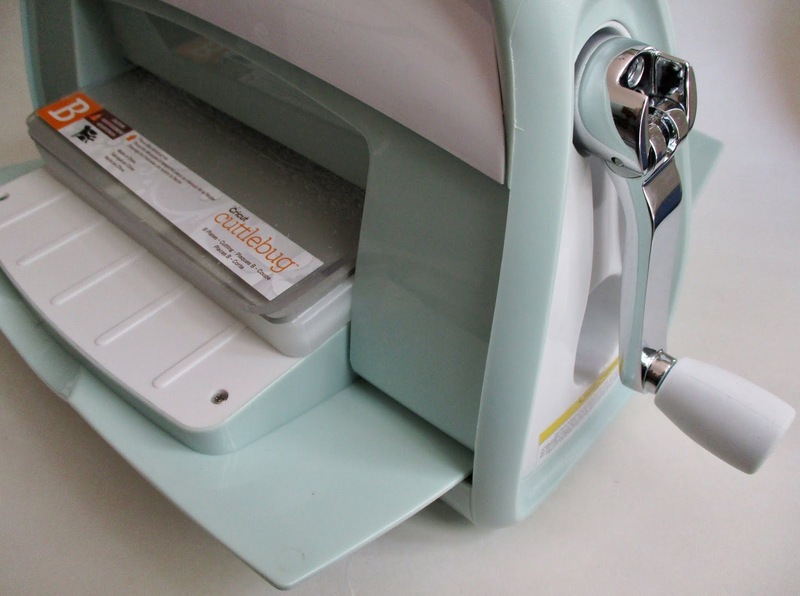 My birthday was last month, and I used the Amazon gift card my husband gave me to get this Cricut Cuttlebug machine for die cutting and embossing. 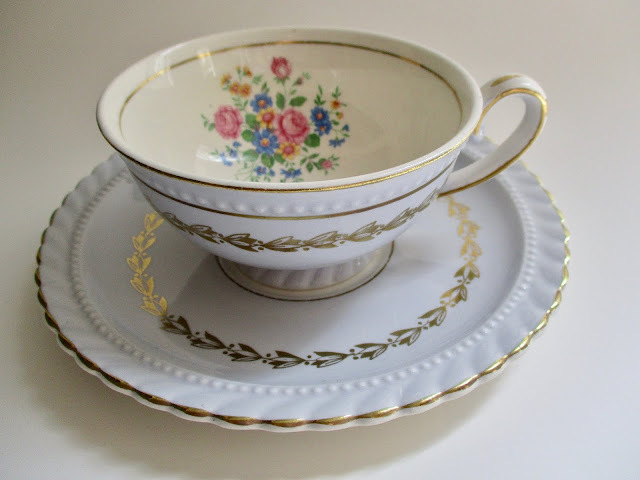 And then a gift from my oldest niece funded the purchase of the prettiest tea-themed dies I have ever seen, this Vintage Tea Party line by Sara Davies of Crafters Companion, founded in the UK but with an office in the US as well. 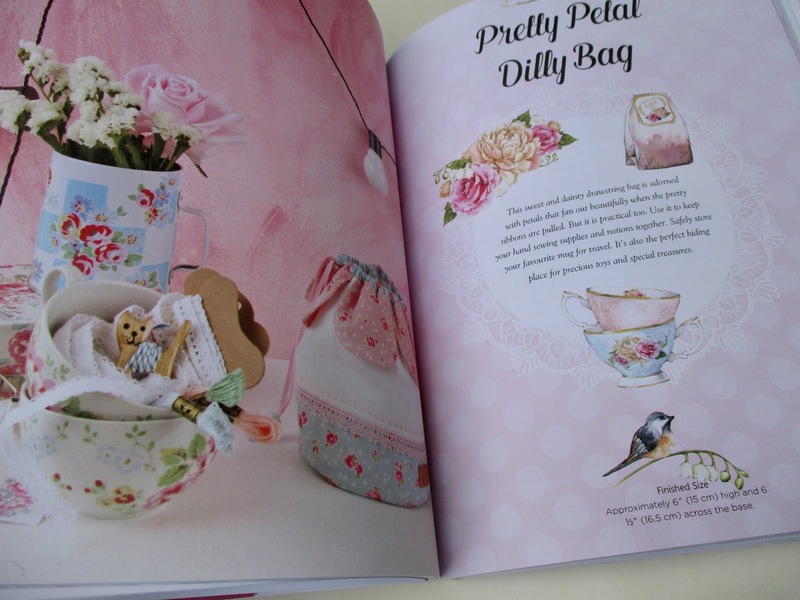 I ordered my goodies on eBay from a seller in the UK when I found that I couldn't get all the ones I wanted on Amazon, but I have seen some of the line there and some in the Paper Wishes catalog, in case you happen to like them as well! It's taking me a while to learn the tips and techniques of this brave new world of what I consider "fancy" paper crafting, but I'm up to the challenge since I am so enamored of all the pretty tea-themed dies I have discovered. 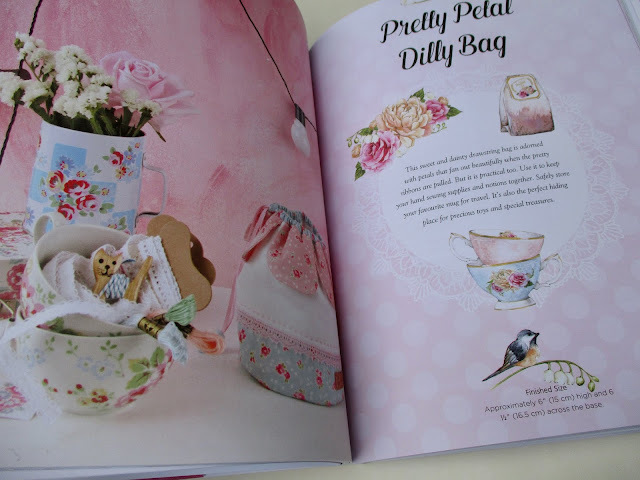 This lacy one from the Vintage Tea Party line has so much detail! I'm having lots of fun with my new toys, and I plan to share some of the notecards and other crafts I make in the days ahead. 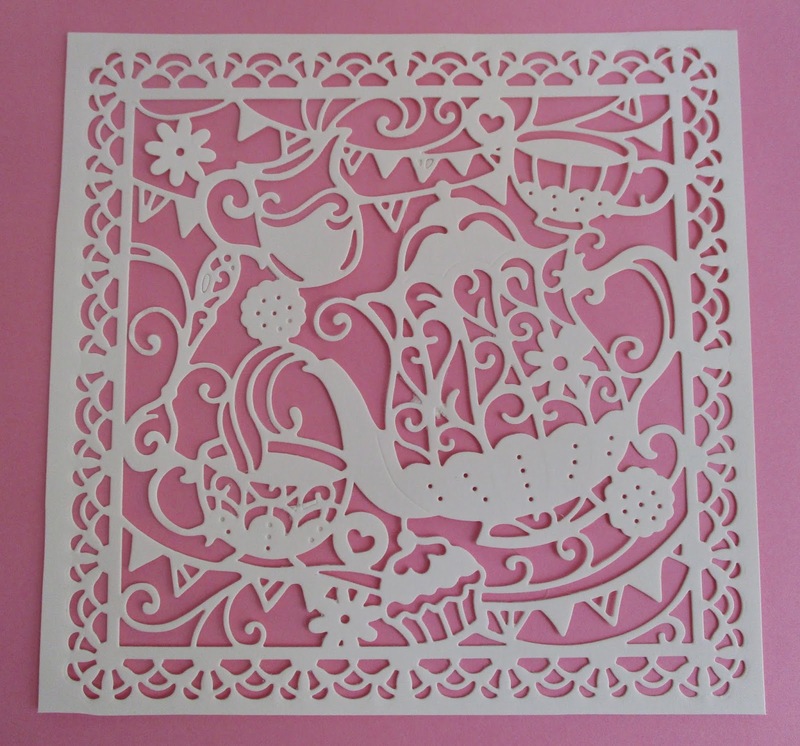 If you happen to be a Cuttlebug user, or perhaps you've long advanced to one of the larger electronic Cricut machines, please share any tips and links you think might be of interest. I do know that my friend Joy got a Cuttlebug about the same time I did, so I'm quite happy I know at least one other tea lover who is exploring this form of paper crafting! 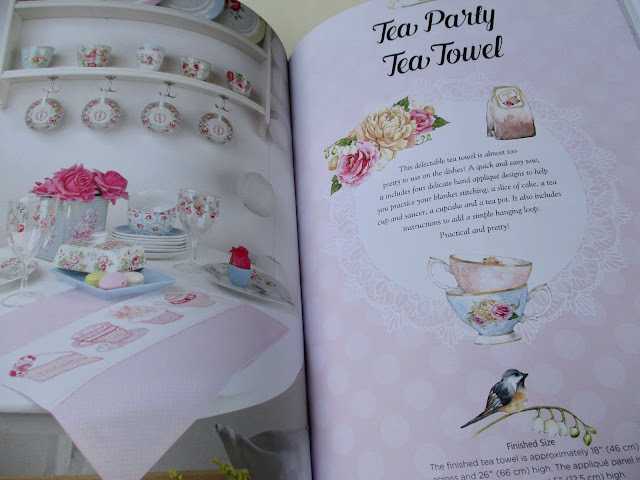 The latest issue of the Upton Tea Quarterly arrived this week, and as always, I found it to be quite enlightening and entertaining reading. In the front of the book, I learned that Darjeeling production has "decreased from an annual average of 5.5 million kilograms to 3 million kilograms in 2017," a reduction of nearly 67 percent (!). 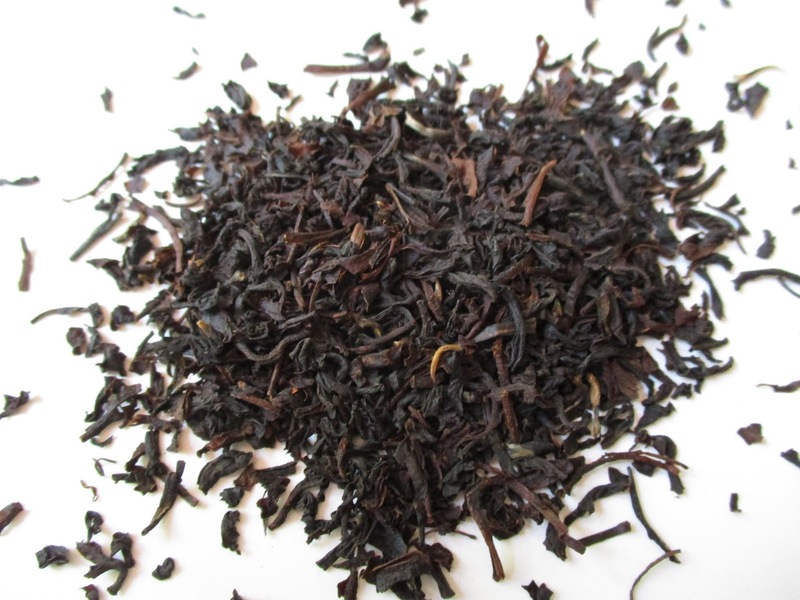 I haven't bought any new Darjeeling tea in a while, and sure enough, the prices are much steeper than I would have expected, so if we're looking for quality Darjeelings, I guess we can expect to pay more for them, thanks to "a worldwide surge in demand and a limited supply of quality tea." So that's the bad news. The good news is that there's a delightful feature on Roy Fong, owner of the Imperial Tea Court in San Francisco and a name quite familiar to those of us who study tea in this country. My favorite quote of his: "Tea chose me. Looking back, there was no other path but tea." If you'd like to check out this issue for yourself, click here.